SEOUL (Reuters) - Veteran North Korean diplomats are being sidelined from nuclear talks ahead of a second summit with the United States as recent defections and allegations of spying undermine the trust of leader Kim Jong Un, South Korean officials and experts say. Kim has purged and replaced many top diplomats and officials who served his father and grandfather with new, younger advisors as he gears up to meet U.S. President Donald Trump in Vietnam next week. Among the most significant changes, Kim has appointed little-known Kim Hyok Chol to spearhead working-level talks with U.S. nuclear envoy Stephen Biegun. 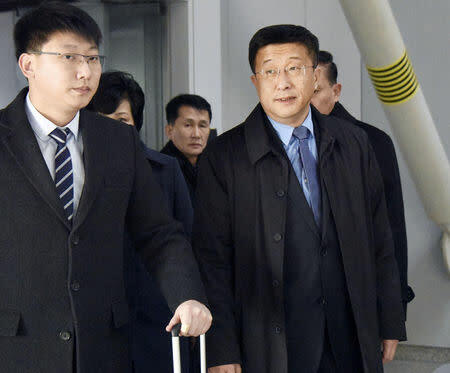 A former ambassador to Spain who was expelled in 2017 after North Korean nuclear and missile tests, Kim Hyok Chol has been working at the State Affairs Commission, a top governing body chaired by the young leader, a South Korean official said. He replaced Vice Foreign Minister Choe Son Hui, who led negotiations in the run up to the first Trump-Kim summit in Singapore in June. "It's a big boys' game and many diplomats are being neglected, as they face fierce inter-agency rivalry and questions about their ideological faithfulness given their experience in richer, capitalist nations," the South Korean official said, asking to remain anonymous due to the sensitivity of the issue. "Kim Hyok Chol is a career diplomat too, but he apparently has passed a loyalty test to become the point man in the negotiations." The promotion of Kim Hyok Chol, believed to be in his late 40s, was partly influenced by the 2016 defection of Thae Yong Ho, a former deputy ambassador to Britain, and the recent disappearance of Jo Song Gil, a senior diplomat in Italy, the official said. Adding to Kim Jong Un's mistrust in veteran diplomats, Han Song Ryol, who was vice foreign minister in charge of U.S. relations until early last year, has been purged on charges of spying for the United States, two sources with knowledge of the situation told Reuters. Han was one of the best known and highly respected North Korean diplomats in the United States, having for years manned the so-called "New York channel," a key diplomatic conduit between Pyongyang and Washington, before returning home in 2013. But Han has been out of the public eye for the past year, with state media last mentioning him in February 2018. South Korea's Unification Ministry removed his name in its annual 'Who's Who' in North Korea directory, released last month. A diplomatic source in Seoul told Reuters, citing North Korean officials, Han was purged last year after being accused of spying for the United States and pocketing funds. Michael Madden, a North Korea leadership expert at the Washington-based Stimson Centre who regularly speaks with sources inside the country, said two people told him Han faced "espionage charges" and disappeared last July. Thae also said Han had been purged, which means he was likely to have been sent to a labor camp for reeducation or possibly executed. South Korea's Chosun Ilbo newspaper also reported last month, citing an unnamed source, that Han was sent to a labor camp after making an unspecified proposal on the nuclear talks against the ruling Workers' Party's guidelines. An official at the Unification Ministry said the information on Han could not be confirmed. "There were financial problems, but the biggest thing was his spy allegation. Several other diplomats, especially those who were close to Han, were investigated," said the first source, who spoke on condition of anonymity due to the sensitivity of the matter. In a 2017 report based on interviews with 20 elite defectors, the North Korea Strategy Centre, a defector-run think tank in Seoul, said more than 70 officials have been executed since Kim took power in late 2011. Thae said at least 10 diplomats were killed under Kim, and replaced by younger aides and loyalists. Many other diplomats and officials have been sidelined. In a Facebook post last week, Russia's Embassy in North Korea confirmed Kwon Jong Gun was the new director of the foreign ministry's North America Department, a post that has been vacant since Choe became a vice foreign minister. Choe's boss, Foreign Minister Ri Yong Ho, a former nuclear envoy who was widely expected to be U.S. Secretary of State Mike Pompeo's counterpart, has never had a chance to show his credentials as Kim continued to rely on Kim Yong Chol, a former spymaster specialized in inter-Korean affairs. Thae, the former diplomat in London, said the unorthodox new breed of negotiators was aimed at driving a wedge between the free-wheeling Trump and his team of technocrats, who were mostly cautious and skeptical about North Korea's claims of pursuing denuclearization. "North Korea's diplomacy has taken an unprecedented tactical course, which is tailor made for Trump," Thae told a news conference in Seoul on Tuesday. "By appointing Kim Hyok Chol, Kim Jong Un was trying to give the impression that there's no one between them, so that Trump will talk to him and shut his ears to his own staff."